Seleccione el servicio en el que va a copiar el contenido "Romeo and Juliet - Integration Project"
Many years ago in Verona, Italy, there were two families. These families are always fighting. The Montagues have a son, Romeo. The Capulets have a daughter, Juliet. One night the Capulets have a party and Romeo goes. He meets Juliet and they fall in love. Juliet’s cousin, Tybalt, sees Romeo and is very angry. Romeo and Juliet talk and decide to get married. They know that their families will be very angry so they go to Friar Lawrence and are married in secret. The next day, Tybalt sees Romeo. He is still angry with Romeo and wants to fight him. Romeo doesn’t want to fight but his best friend, Mercutio, does. Mercutio fights Tybalt. Tybalt kills Mercutio! Romeo is so upset he fights Tybalt and kills him too! The Prince of Verona is very angry and sends Romeo away. Juliet goes to Friar Lawrence for help. Friar Lawrence sends Romeo a letter to tell him the plan. But Romeo doesn’t get the message. He hears that Juliet is dead! Romeo is so upset he buys some poison and goes to see Juliet. Too late, Juliet wakes up! She sees what happened. 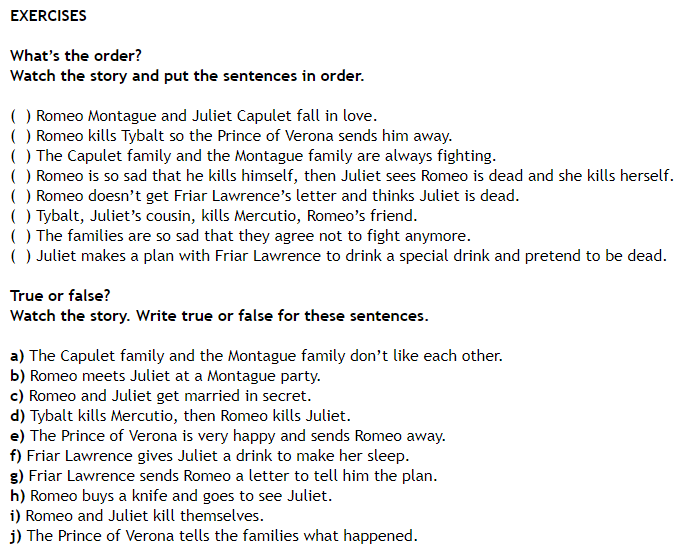 Romeo and Juliet are both dead. Friar Lawrence tells the Capulets and Montagues what happened. They are so sad they agree not to fight anymore. Think about it! What do you think? Is it important to try to forgive people when they do something bad to you, instead of fighting with them? Why?